The future of private infrastructure ownership is moving to a new model combines the old with the new that I describe as “dolls and babies” where the major transformation in infrastructure ownership is the transition from having babies to owning dolls. Enterprises buy infrastructure like people have babies. It takes months to make a baby, creates a great deal of disruption during their delivery and it wasn’t easy to change work practices when the baby arrived. And, like a real baby, it involves large capital investments and enormous amounts of ongoing feeding and care. Preparing the space, learning how the handle the baby and what it needs are all challenging things for the ‘new parents’. In the last five years, we have have seen many structural changes in manufacturing of hardware through commoditisation. Indeed, its become so cheap to make new hardware, or extend the life of existing hardware that large companies like EMC & Cisco can produce multiple product families with major overlap. Comparisons show that EMC’s VNC and VMAX or Cisco’s Nexus 6000/7000 products in the data centre have so much overlap that it buyers find it hard to pick out the obvious differences. Logically, the profit margins must be able to sustain entire business units to produce and develop the platforms. The alternative option is to consider asset purchases as dolls. Something to be bought cheaply, used for a short period and then tossed aside after a year or two. A doll asset might live on for a while on the toyshelf before being tossed as rubbish. 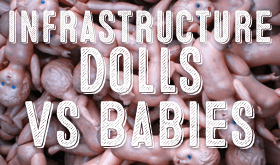 Infrastructure as dolls uses a concept of replacement and rotation. This requires change in business process and technology section to enable rapid change, faster deployment and so on. Buy doll clothes instead of baby clothes. We have all heard those concepts before as “private cloud” which enables “doll” concept. See Cattle vs Kittens for more detail. Transition – Are Customers Are Becoming Wiser ? Vendors are reluctant to adopt the “doll” business model. Firstly, they are often deeply attached to their babies and reluctant to change. Secondly, delivering babies is very good business for vendors. High priced goods that require large upfront investments make for good cash flow and trailing revenue. Customers are becoming better parents and realising that they have too many babies. Having fewer babies is about family planning and careful career choices. Creating and raising babies is the way that IT Infrastructure has developed over the last 20 years. As our babies grow up and become teenagers, many are realising that our ‘teenagers’ are not exactly right for the nest generation. If only we have chosen dolls instead of babies, we could put the old dolls away and get new ones without causing any damage. We need Dolls not Babies in IT Infrastructure. I’ve talked before about the cattle vs Kittens but feel that this metaphor is more suited to operating systems or virtual machines where systems need less maintenance, low capital and have limited physical presence. In the physical infrastructure, the device configuration is largely unchanged for most of it’s life. For both storage arrays and network switches in the data centre, configuring a few LUNs or adding a few ports to a VLAN constitutes a trivial delta in terms of overall functionality. All of the big decisions are made during the design phase where selection, features, location and implementation are all fixed before the roll out. Servers are already priced as consumable items and easily replaced in many use cases.